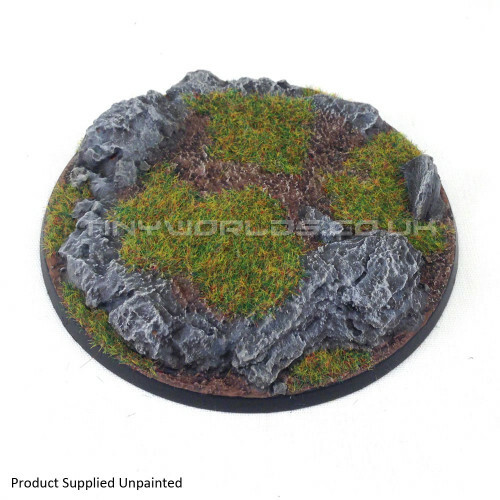 A detailed 130mm round miniature base suitable for a number of sci-fi and fantasy wargames. This fantastic scenic base shows a sculpted rocky surface and is fantastic for adding an additional level of detail to your miniatures, quickly and effortlessly. Made from a durable cast polyurethane resin, this base is sold unpainted and without flock. Painted samples shown to clarify detail and show what can be achieved with minimal painting skill. The bases are straightforward to paint with a superb level of detail and can be freely mixed with bases made by numerous other manufacturers to create a one-of-a-kind army.